Greetings, dear readers, and happy hump day! This week has been flying by quickly, and I have a three-day holiday weekend to look forward to! We're not really big fans of traveling for holiday weekends and prefer to avoid the crowds, so we're going to be staying close to home and trying to get some home repairs taken care of. I'm so fancy, right? Haha! Now on to today's blog post! 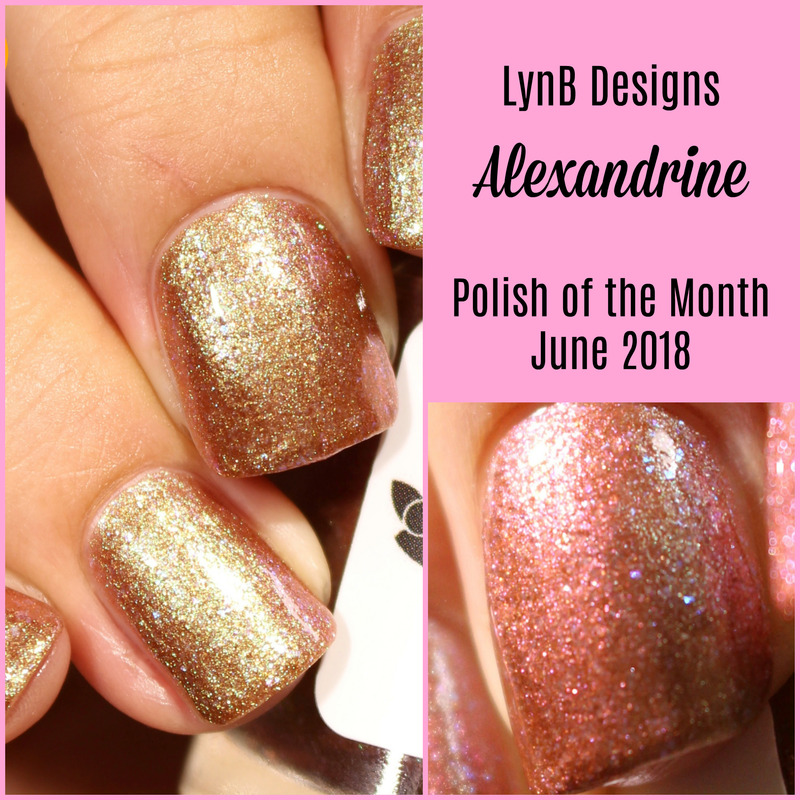 With May quickly coming to a close, that means another month is upon us to include a new Polish of the Month by LynB Designs! Jenna, the creative mastermind behind the brand, has opted to pull her inspiration for the monthly polishes from birthstones each month, and she has been knocking it out of the park with every release! She selected Alexandrite for her June inspiration, and Alexandrine will be launching this week! Let's get a closer look at this beauty! Like its inspiration, Alexandrine is a unique and complex polish! Alexandrine starts off with a reddish brown base shade and contains intense red to green to purple shifting shimmer and blue to purple iridescent flakes. Alexandrine was a little tricky for my camera to photograph, and the green shift in particular was much more obvious in real life than in the photo above. Away from my light setup and at certain angles, the red and purple shifts came out to play. This is such a fun and pretty polish! I have no issues regarding the formula to report about Alexandrine. It is slightly on the thicker side as I've come to expect from indie polishes in general, but it certainly was not too thick to apply to the nails. I had no issue with it whatsoever and had no need to add thinner to it. The first coat was the slightest bit streaky, but it evened out nicely with a second coat. I wore it with two coats plus top coat for these photos. Alexandrine will be launching this Friday, May 25th at noon EST. It will retail for $10. LynB Designs is also going to be having a special Memorial Day sale this week starting at the same time, so if you want to save some money, be sure to pick it up this week for half off the normal price! Two polishes for the price of one? Oh, yeah, sign me up! Are you a June baby? Will you be adding Alexandrine to the rest of your birthday Polish of the Month polishes? What other LynB Designs shades are you thinking of picking up during the Memorial Day sale? I'd love to hear from you! good to know the formula is just right. it's a pretty shade! I really like how this shifts. I think it's interesting that LynB didn't go with the traditional Pearl but picked up the more interesting Alexandrine. I've always been a fan of birthstone series, especially when a brand goes outside of the "traditional" gem! Oh I definitely need this. The color shift is amazing! I love the gold-red-purple shift. Alexandrites have so much dimension to them - I want to own some kind of jewellery with alexandrite one day. ooo I love the rosey look! Beautiful swatch and polish. I love how you capture the reddish shift! That's my birthstone. I love the dynamic look of this polish. I just love that rosey glow!!! Stunning!! I think that's a really good representation of Alexandrite, expecially the purpely shift. It's my birthstone, depending on which list you follow. That shift is too good! I feel like this is a polish I have to see IRL to believe. Polishes like this are always so tricky to photograph!